On Monday, John and I took a reconnaissance drive to Argentia to poke around and see what there was to see and to determine if there was anything substantial worth exploring on a more lengthy trip. We bombed out the highway and then headed down the Argentia Access Road towards the base. Argentia was originally called “Petite Plaisance” when the French occupied it (until 1713/1714, with the signing and enactment of the Treaty of Utrecht). Most recently it was an American Naval Base from 1941 to 1994. Since then it has been in transformation. There are some trails (although these are mostly side jaunts from dirt roads) and a limited amount of recreational usage has been attempted. There is also a substantial amount of not-so-nice residue from the period of its military usage, which makes the whole area a little risky for ordinary civilians to explore, since there’s no knowing where toxic gunk or dangerous spots containing sharp metal and soft ground might be. 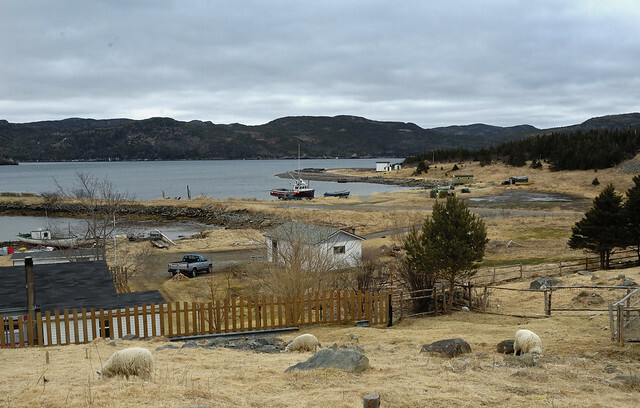 Sheep grazing in Ship Harbour. It was a very small place and very cold. Best seen in summer! Along the way down the access road, I was looking at maps and spotted a side road that led to Ship Harbour and Fox Harbour. In the spirit of adventure, we detoured down what can only be described as the worst paved road in Newfoundland. The section to Fox Harbour wasn’t bad, but the portion to Ship Harbour may as well not have been paved. There were a couple of neat spots along this route. The Atlantic Charter, which later formed the foundations of the United Nations Charter, was signed at the entrance of this harbour. Roosevelt and Churchill met there (in summer, smart fellows) and signed the charter. We didn’t head in to the monument, as we had decided that a return trip at a more temperate time of year was definitely in order, if for no other reason than to climb nearby Sugarloaf Hill. We did an about-turn and rolled our way back up and down some pretty phenomenal hills while playing asteroids with the potpits (“pothole” being an inadequate term for these crevasses). Then it was into Placentia to grab lunch and off to Argentia. Along the beach. The clouds kept doing weird things. 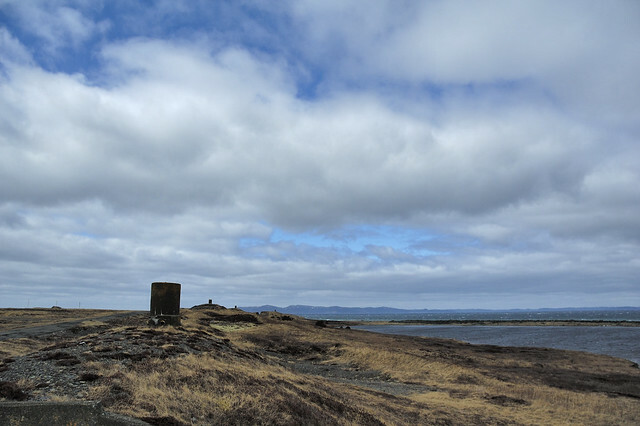 Initially we had intended to focus on the Backland Trail, but decided, in light of the bone-penetrating northerly wind, to take a drive around the peninsula and plateau first. We were awfully glad that we did. 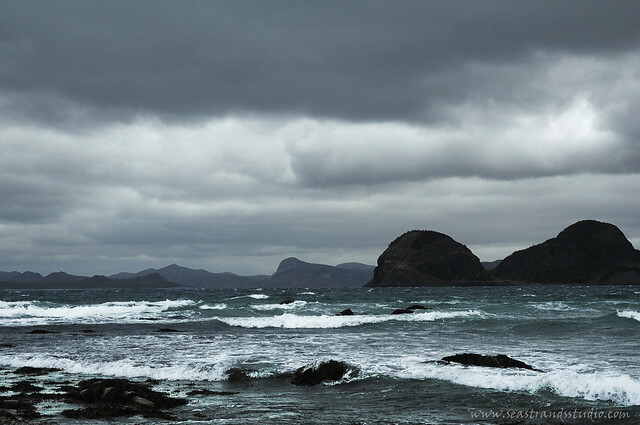 The light kept shifting and the clouds were doing the strangest thing (welcome to Newfoundland, where the weather changes every half hour). 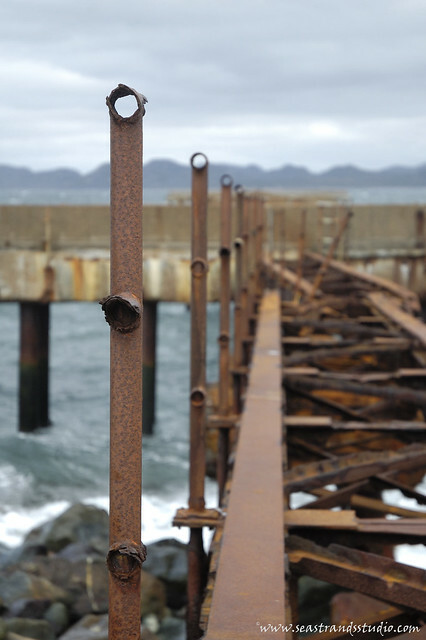 The old framework that once held the runway guidance lights. There wasn't enough land to put them on, so they plunked them in the ocean. In fact, you could look in one direction and see storm clouds and turn your head for blue sky. The old railings of the walkway out to the runway lights. Perhaps the most surprising part was simply the expansiveness of the whole setting. 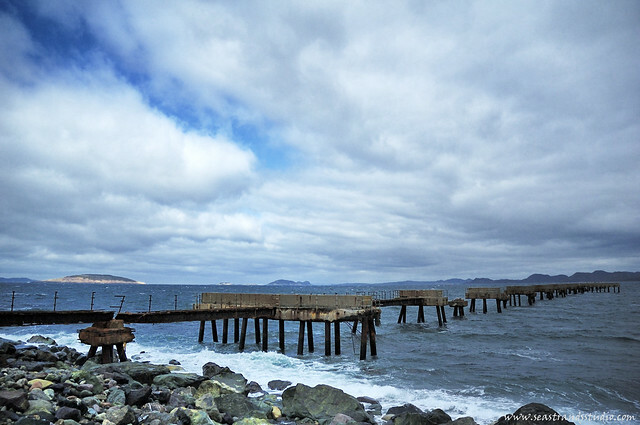 It was sky, sky and more sky, with ocean all around and headlands receding to the horizon. One of the neat spots that we discovered was a series of bunkers forming hillocks. They were particularly boring inside (just Quonset huts covered in dirt, with concrete floors) , but standing atop one it felt rather like looking along the tops of hobbit houses. I think my favourite shot of the day was taken in this same area. There was one bunker that was different. 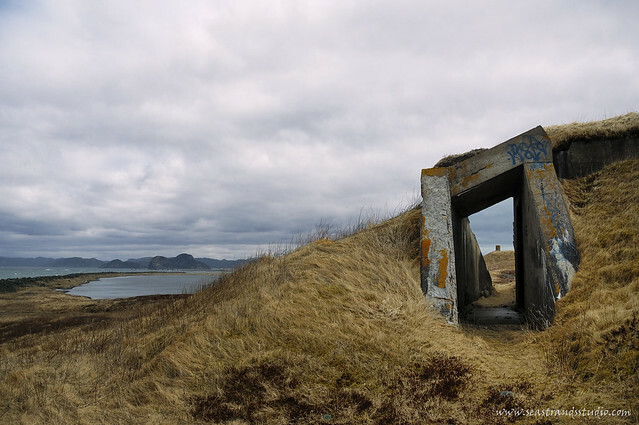 it had a tunnel-like entrance and wasn’t a Quonset, but rather had two concrete rooms. I suspect it might have been a guard house or a storage spot for something completely different than the contents of the other bunkers. Whatever the case, it provided nice framing for this shot. It will be nice to head back in summer, when the wind isn’t so hard on the fingers and the skies are different. I’ll bring along my respirator so that I’m not so nervous about looking into more of the bunkers, too. Taking a timed exposure is no fun when you’re holding your breath. We did take a cruise around the Backland Trail, but it wasn’t nearly so much fun as hands-free driving, up and down the runway on the plateau. Beautiful photos, wish I could see this scenery in person! Great photos! The rock formation in your second picture is called Mae West or The Twins by some residents. Fascinating history in Argentia and Placentia. Thanks for stopping by, Suzanne! I appreciate the information very much! !